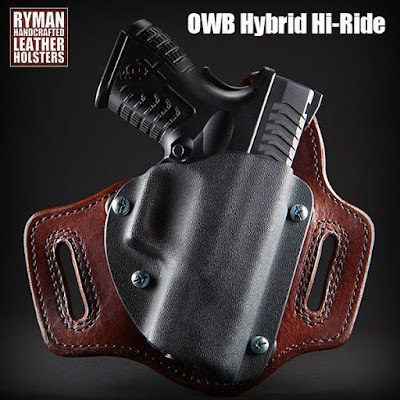 OWB Hybrid Leather and Kydex Holster for Springfield XD, XDm, XD Model 2, 1911, and many more! It features adjustable retention via 4 attachment points. The mounting hardware is embedded inside the leather back (no nasty hardware against your body). The double stitched, reinforced belt slots are placed to make the holster ride a bit higher than normal holsters. This helps to keep the entire rig better concealed beneath a jacket or shirt. The double-thick leather back (2 layers of 8-9 oz. veg tan leather) keeps the rig from flopping away from the body, which can occur with other hi-ride holsters. Check prices and availability here: Ryman Holsters Hybrid Hi-Ride for Springfield Armory XDm, XDs, XDm XD mod2, XD model 2 and many more! 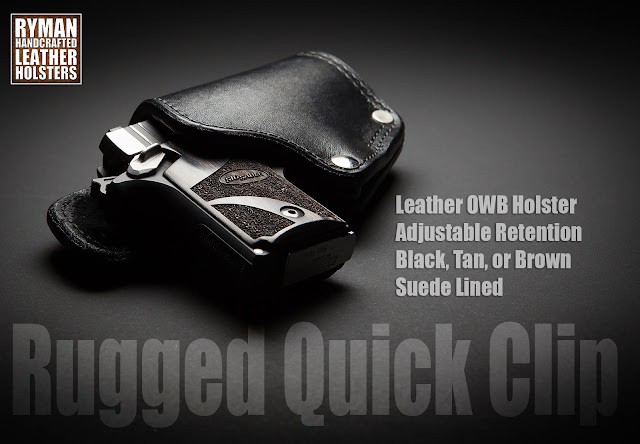 Cross Draw OWB Leather Holster with Suede Lining for Ruger Redhawk 44 magnum Talo Edition. 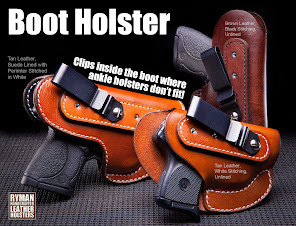 The perfect drivers' holster... no more wrenching your shoulder out of socket trying to retrieve your firearm from a seated position. 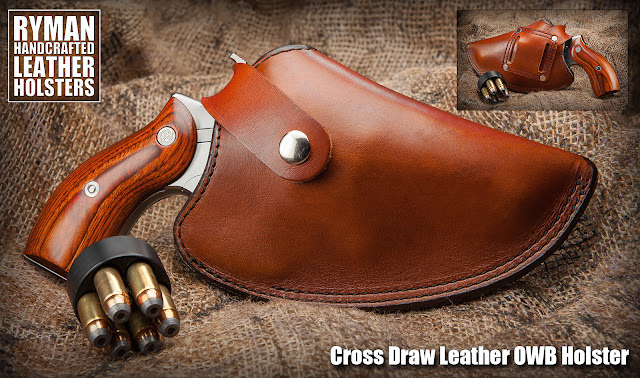 The Cross Draw outside-the-waistband leather holster from Ryman Holsters is designed to be worn on the left, at about 10 or 11 o'clock on the body for right-handed shooters (opposite for south paws). 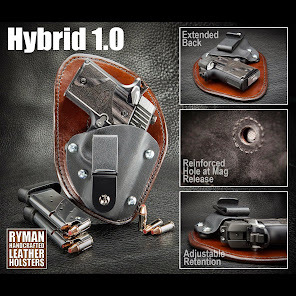 The unique design of Ryman Holsters' Cross Draw features a retention strap allowing the holster to be carried at a lower angle- slightly above parallel with the belt line. This enables the wearer to draw across the body in a natural motion instead of a lifting motion like other cross draw designs. 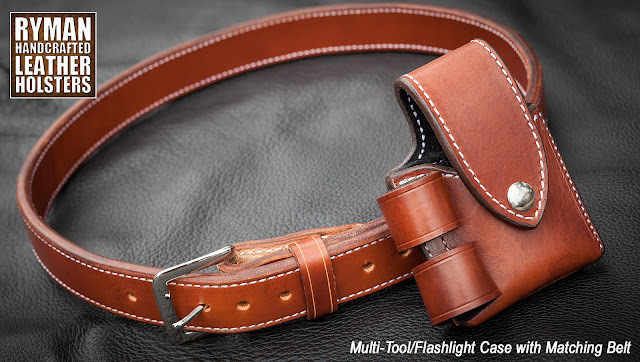 Belt mounting options include a leather loop (pictured) or a wide steel clip. The steel clip version can be employed without removing the belt, but is not suggested for large firearms. 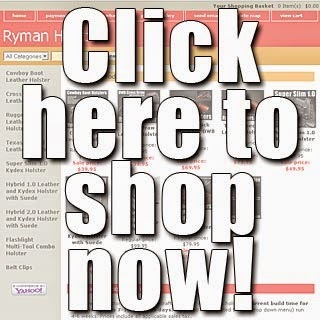 Check prices and availability on Ryman Holsters' website... www.RymanHolsters.com. The Rugged Quick Clip from Ryman Holsters is the perfect holster for clipping to your belt when you don't want to completely remove the belt. The wide steel clip attaches to 1.5: belts and is surprisingly stable for a single mount OWB holster. The optional leather loop version can accommodate almost any size belt but does require the wearer to undo the belt from the pants to put on the holster. 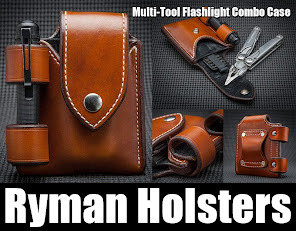 The Rugged Quick Clip Holster from Ryman Holsters features an extended sweat shield for semi-auto pistols or extended sides to protect the hammer on revolver versions. Both versions feature adjustable retention. 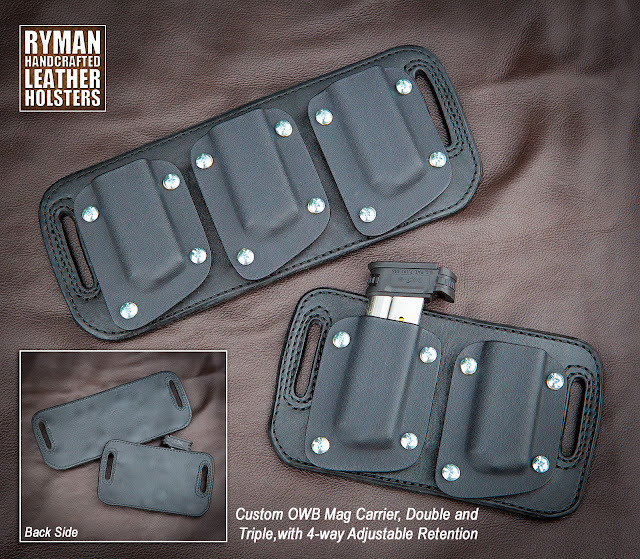 The Rugged Quick Clip from Ryman Holsters is exactly that... rugged; and that's not just on the outside. The interior of the American-made, outside-the-waistband leather holster is lined with durable 1 oz. suede. Leather color options include black, brown, or tan. Choose black or white thread. 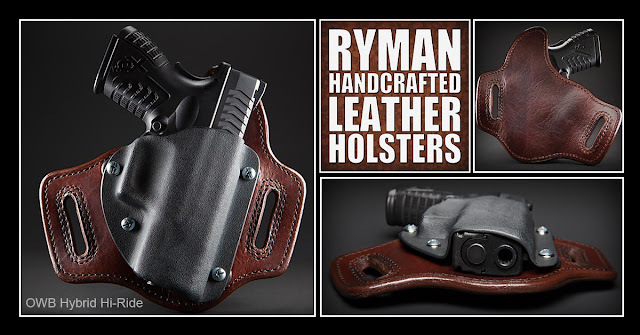 At Ryman Holsters, there are no long manufacturing lines churning out one-size-fits-most generic holsters. 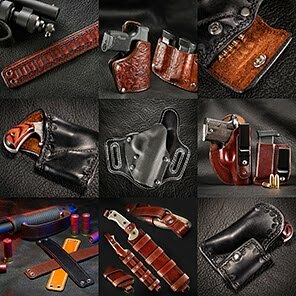 Jason Ryman handcrafts every holster, to order, with great care and attention to detail. 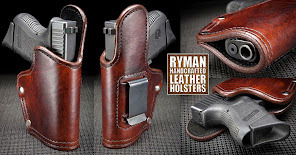 Check prices and availability on Ryman Holsters' website, www.RymanHolsters.com. Custom OWB Mag Carrier for IDPA. Custom OWB Mag Carrier, Double and Triple with 4-way adjustable retention on each shell. Here's something a bit different because I don't do too many belts. Holster for NAA 22! OWB Cross Draw for North American Arms 22, LR and Mag! 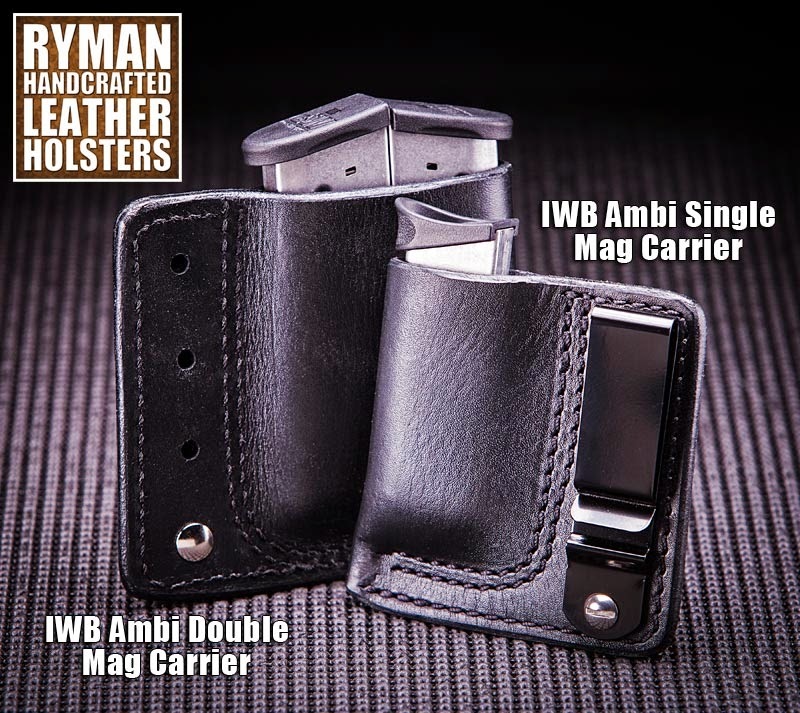 Superior Quality Leather Holsters from Ryman Holsters. Cross Draw holster for the NAA 22LR/22Mag revolver! 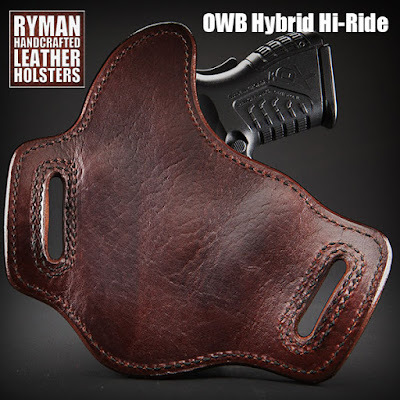 Check options and pricing on the website- www.RymanHolsters.com. Holster for Sig P938, Sig P238, and many other models! Hybrid 1.0 with Extended Back plus options! 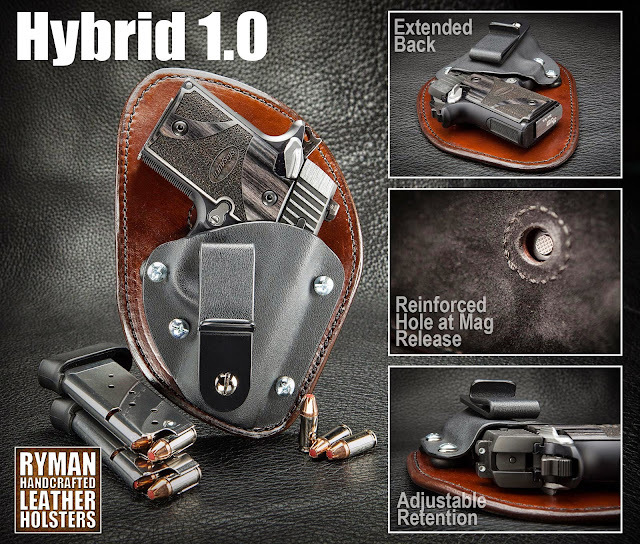 Here's a Hybrid 1.0 IWB holster with optional extended leather back. This is kind of like the opposite of the cutaway option. The extended back ensures that no part of the firearm contacts the body. Another option is the reinforced hole at the mag release. This hole prevents the mag from being accidentally ejected. The belt clip in this pic is the regular length J clip. Clip options include extended J, C, extended C, and steel. Can't decide on one clip? There's a Master Pack available that includes all five types! As with all of the H1s, the retention is adjustable on both the slide and trigger, and the hardware is embedded within the holster. The back is lined with suede... no t-posts or other mounting hardware contacts your body or the firearm! 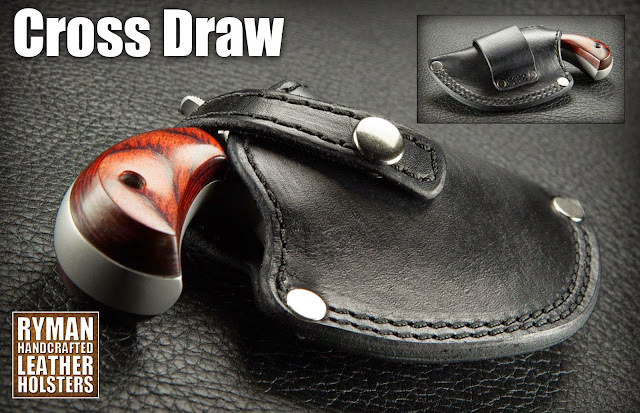 Cross Draw Holster for Smith and Wesson, Ruger, Glock, Springfield, Kahr, Kimber, Para, and many more! Perfect for driving, sitting, or limited mobility situations. 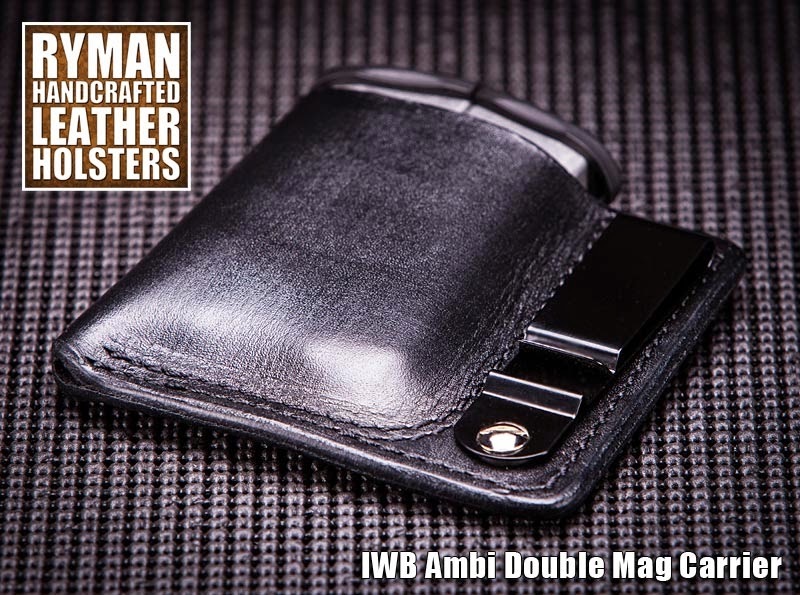 IWB Ambidextrous Magazine Carriers for Glock, Ruger, Shield, M&P, Springfield, 1911 and more!